Home News Innov’Space 2018 award for Denkapig Mellow Go! 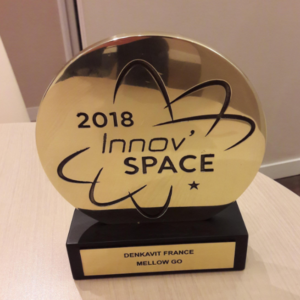 Innov’Space 2018 award for Denkapig Mellow Go! Denkapig Mellow Go, a new prestarter for piglets developed by Denkavit, was awarded an Innov’Space 2018 award. This was announced at the exhibition Space in Rennes, which took place from 11 till 14 of September 2018. Mellow Go is an innovative product due to its production process, it allows a good feed intake in maternity and makes life easier for the farmer. Mellow Go has a distinctive presentation. It is a soft pellet with a star shape. 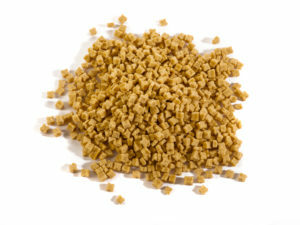 This product is obtained thanks to a unique process, developed by Denkavit, and to the use of solid and liquid raw materials. The texture of Mellow Go is in between the one of a prestarter and the one of milk. The product is 40% softer than a standard pellet. Thanks to its texture and palatability, a higher weight at weaning has been observed due to a high feed intake in maternity (feed intake of Mellow Go and prestarter feed). Additionally, a visible effect has also been observed after weaning also due to a good intake at this period. Another interest of the Mellow Go is for the farmer’s working comfort. Mellow Go can be distributed directly and do not request any preparation, for example as for a porridge, to get a high feed intake.